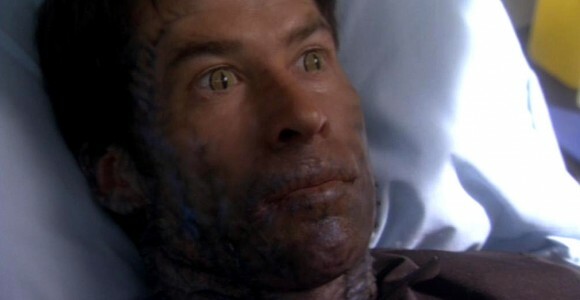 Colonel Sheppard begins to undergo a disturbing physical transformation after being exposed to Beckett's anti-Wraith drug. Colonel John Sheppard and his unit return from Zaddik’s planet (“Instinct”). John is rolled into the medical bay where Dr. Beckett examines Ellia’s feeding wound. In the midst of his examination the entire gash disappears. Beckett believes that Ellia transferred a quantity of the iratus bug retrovirus through Sheppard’s arm and into his bloodstream. His physical abilities have accelerated. He can easily outdistance Dex in a jog and quickly disables Teyla of her fighting rods, unexpectedly leaping out of character and kissing her square on the mouth. Dr. Elizabeth Weir invites Colonel Caldwell to assume Sheppard’s duties while he is off active duty, but makes it clear that this will hopefully be only a temporary situation and that the Colonel will soon recover. Meanwhile, Sheppard finds an insect-like growth protruding from his arm where Ellia “bit” into him and ups the schedule on his next checkup with Beckett. The retrovirus was never designed for a human, but a Wraith. Beckett had hoped that the human body would absorb and eventually destroy the serum, but that is not happening. Sheppard is assigned a guard. Beckett gathers the Atlantis scientists together to come up with a plan to reverse the retrovirus’s effects. Everyone agrees that administering re-sequenced cells of a full iratus bug, designed to seek out and destroy the alien elements in Sheppard’s body, would do the trick. Unfortunately the only sample is a dead bug that has been on ice for over a year (“Thirty Eight Minutes”). Beckett decides to send a team to a planet identified in the Ancient database as a world of the iratus bugs (but not the Wraith homeworld) to capture several eggs to harvest. Sheppard learns of the plan and wishes to go with the team to the planet. If his team is going to put their lives on the line to save him, he feels the least he can do is offer backup. Weir fervently disagrees. Enraged, Sheppard smashes one of her office windows overlooking the gate room. Weir considers the decision closed and Sheppard willingly returns to the infirmary. Weir confronts Colonel Caldwell about his sweeping changes in the security protocols of the city and the off-world duty roster. Caldwell, who has wanted the position from day one, tells Weir that he has only made changes to bad decisions Sheppard has made in the past, but Elizabeth is furious that he did not even wait a day to make the changes. He has only sent one signal to the Atlantis expedition: Sheppard is not going to survive. Lorne, Beckett, Rodney McKay, Teyla, Dex, Stevens, and Walker travel to the iratus bug planet and locate a cave tucked against a mountain range. Inside a lair of possibly thousands of iratus bugs cluster, protecting their eggs (suspended in sacks on the ceiling). Beckett attempts an approach using salt water to make a path, but when one dangles by him with intent to feed Ronon uses his gun to disable it, sending the countless others in a frenzy. Walker and Stevens are killed in the evacuation. Weir reports the bad news to Sheppard whose transformation has continued. Now at his wits end, he takes matters into his own hands, disables the two SF’s at the door and escapes into the city. A team is sent to capture him, but he disables all members of the party save for Teyla — and Dex, who neutralizes him with his gun. Now back in the infirmary, Beckett has placed the Colonel into a medically-induced coma. In 24 hours, John Sheppard will be gone forever. But Carson believes he has a plan. The iratus bugs release a very discernible pheromone — likely one of the ways used to recognize other members of its species. Synthesizing the pheromones would take days, but Sheppard already possesses them. With a final dose of the inhibitor, Sheppard, his team and Beckett return to the iratus planet. With minutes remaining before the drug wears off for the final time, the Colonel enters the cave and leaps to one of the egg sacks on the ceiling, extracting a cup full of iratus eggs. While inside the clock runs out, and he emerges from the cave a monster. Ronon disables him. Beckett gathers the eggs and determines they will be enough. Sheppard will recover after all, though Caldwell hopes that he will consider several of the changes the Daedalus commander has made in Sheppard’s absence. Weeks later, John has fully recovered, and pays Teyla a visit in the fitness room. Only a light scar of where Ellia attacked him remains, and this will disappear eventually. Sheppard indirectly apologizes for his force with Teyla, but she instructs him to think no more of it. VOTE! 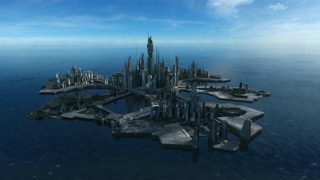 How would you rate Atlantis's "Conversion?"